Creating a pathway to citizenship for immigrants who are in the country illegally is expected to be one of the most contentious elements of the immigration legislation that will be considered by Congress this year. Mexican immigrants are by far the largest group of immigrants who are in the country illegally – accounting for 6.1 million (55%) of the estimated 11.1 million in the United States as of 2011. But nearly two-thirds of the 5.4 million legal immigrants from Mexico who are eligible to become citizens of the U.S. have not yet taken that step. Their rate of naturalization – 36% – is only half that of legal immigrants from all other countries combined (68%), according to an analysis of Census Bureau data. 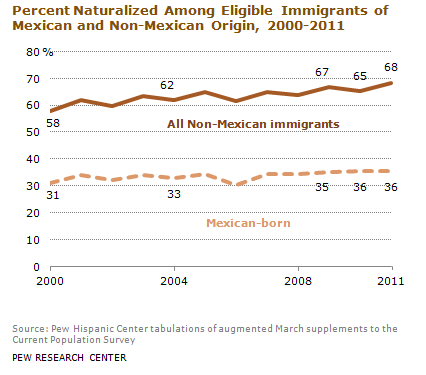 Mexicans are the largest group of legal permanent residents – accounting for 3.9 million out of 12 million. The analysis of current naturalization rates among Mexican legal immigrants suggests that creating a pathway to citizenship for immigrants in the country illegally does not mean all would pursue that option.